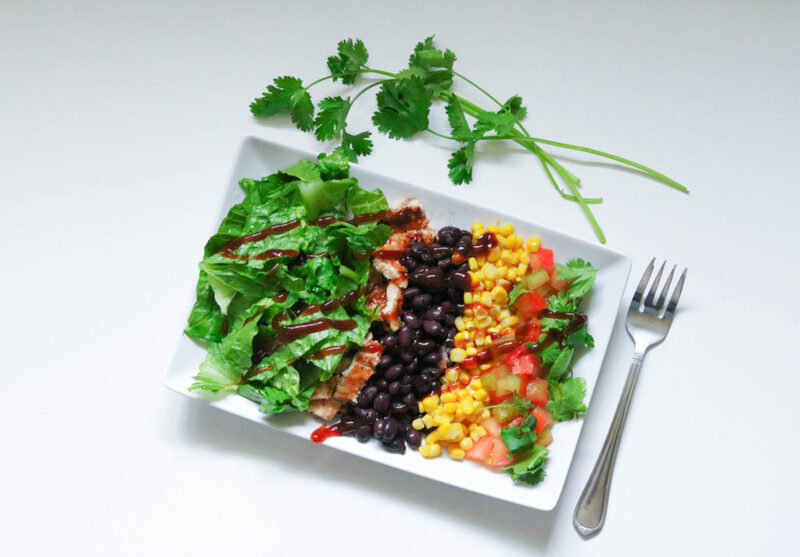 This BBQ chop chicken salad is one of my all-time favorite salads! I also love serving this salad at summer dinner parties as each guest can choose which toppings they want and how much of each topping so that everyone is happy. Directions: Chop up your lettuce of choice and place it in a bowl. 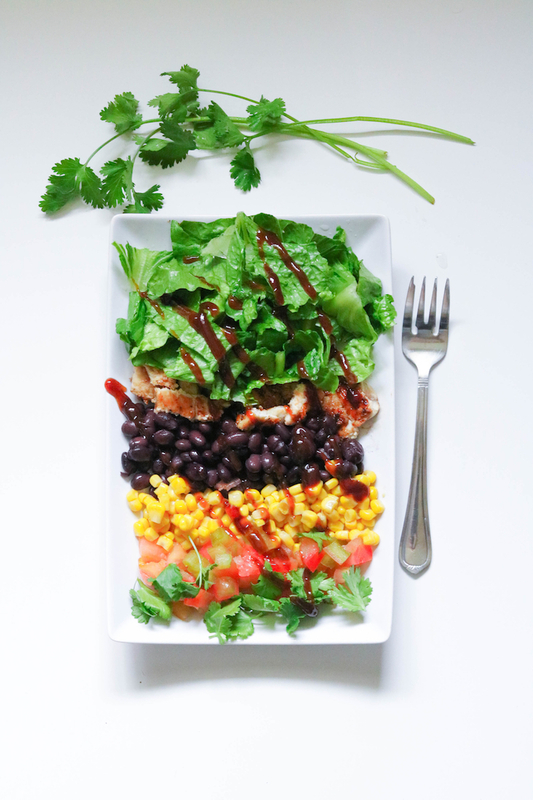 Add your chicken first and then proceed to add the beans, tomatoes, corn, and cilantro. Finally, drizzle with barbeque sauce—even add some ranch dressing. For the base, I like to use romaine lettuce or a dark green or red leaf lettuce. The general rule with lettuce is that the darker it is the more nutritious it is. The second rule of thumb is that the more closed the head of lettuce is, the less nutritious it is. For example, a head of iceberg lettuce is very tight in a ball compared with a red leaf lettuce that is more open. When the leaves are open they have to create more phytonutrients and antioxidants to protect itself from the sun as well as insects. A few varieties that are even more nutritious include arugula, radicchio, and spinach. Romaine and other dark lettuces are great sources of vitamin A and folate—both of which are crucial during pregnancy. Vitamin A is essential for all cell growth and differentiation and is especially important for lung development and maturation. Folate helps prevent neural tube defects and is needed to help prevent anemia as it is necessary for red blood cell formation. I like to top my lettuce with tomatoes. My favorite variety of tomato is grape tomatoes. Not only do they taste sweeter, but they also contain more lycopene and other antioxidants than their larger relatives. Lycopene has been linked with fertility so if you are trying to conceive including foods that are high in lycopene, like tomatoes, may be beneficial. Antioxidants, including lycopene, are important during pregnancy to help keep levels of inflammation and cell damage at bay. Inflammation is linked with the root cause of many diseases, including preeclampsia and gestational diabetes. Next, I add black beans. Beans, especially black beans, provide a wide range of health benefits. They are rich in complex carbs as well as protein, which help stabilize blood sugars and keep you satisfied longer. This is especially important if you have been diagnosed with gestational diabetes. The high protein content of beans also makes them a great option for vegetarians and vegans as ½ cup of beans provides the same amount of protein as an ounce of meat. They are also a great source of fiber, iron, zinc, copper, magnesium, folate and potassium. Beans are also inexpensive and take no prep time if you buy them canned. Corn comes next on my list. It is a great source of B vitamins including pantothenic acid, thiamine, niacin, and folate. Like lettuces, the darker the corn the more nutritious it is, so steer clear of white corn and choose the darkest yellow corn you can find. The yellow color comes from the lutein and zeaxanthin in the corn. Lutein and zeaxanthin are needed for optimal eye health and development—both for you and your growing baby.